Apple is working to fix the battery problems faced by users of devices carrying its i0S 5 mobile operating system, solve a security issue with the magnetic SmartCover for the iPad 2, and add a new multitouch feature to its original tablet. Apple said this week the fix for the battery-zapping bugs will be out “in a few weeks,” yet the two betas -- just two days apart -- means we’ll be seeing the update much sooner than that. 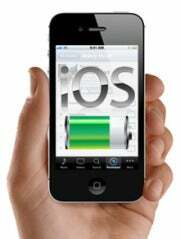 It’s still unclear what’s actually causing the battery problems for iOS 5 users. Some iPhone 4S owners reported their battery would last just hours, with only minimal use, and Apple didn’t say either what’s causing it besides "a few bugs." This led to a sprawl of homegrown solutions to "fix" your battery life problems, which my colleague Ian Paul rather funnily dubbed "sensible battery life management practices" (that seem to be commonplace on Android too). The incremental update to iOS 5.0.1 tackles a few other problems. One of them is a security patch to an issue with the magnetic SmartCover for the iPad 2. The glitch allows anyone to bypass a passcode on the iPad 2 with a SmartCover, by simply holding down the power button until asked to power off. Then, all you have to do is to put the SmartCover on, and then take it off, cancel the power down -- and you’re in. The update promises to bring four- or five-finger multitouch gestures, just like on the iPad 2 (although the feature appeared on the iOS 4.3 beta testing, but it didn’t make the cut in the public release). The gestures allow you to swipe up for the multitasking bar, swipe left or right between apps (similar cards) or to pinch to the home screen.